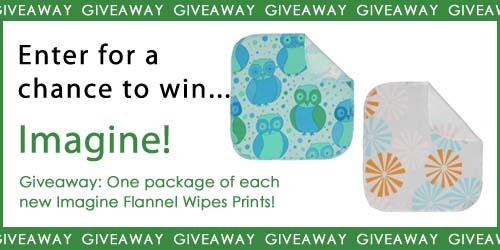 New Imagine Flannel Wipes Prints GIVEAWAY! Bumkins Buy 1 Get 1 FREE! Pucker Up with Lusa Lip Balm! Flip For You Buy 1 Get 1 FREE Sale! Thirsties Duo All-In-One Giveaway WINNER! Happy Hemp Day! Babykicks Giveaway! 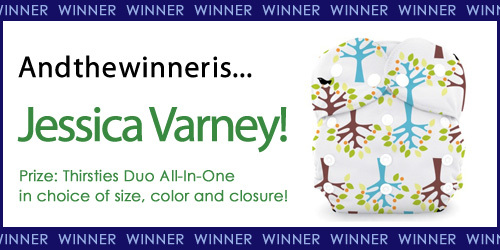 One-Size Diapers are incredibly popular and with good reason! They allow you to change the sizing on the diaper to grow with your child, making cloth diapers even more economical! However, one of the most frequently asked questions we get at Nicki's Diapers is something like, "My 7 month old is so chunky and is already on the largest setting of his one-size diapers! There is no way these are going to fit through potty training! What do I do?!" I can almost hear the panic in their voice as I read it, because I've been there! Let me tell you, it's going to be OK! The vast majority of children DO potty train out of their one-size diapers, even if they were a super chunky baby! Let me tell you my story :) Ian, my oldest son, came into the world more than 4 years ago at a whopping 9 pounds 11 ounces (born at 39 weeks, yikes!). We didn't start cloth diapering him till he was about 12 weeks old and we exclusively used BumGenius 3.0 One-Size Pocket Diapers. Right off the bat, Ian was on the second largest setting and within a couple months, they diapers were fully unsnapped. I was FREAKED! Did I just drop hundreds of dollars on these diapers only to use them for a few months?! Then, he started to crawl and slimmed down a bit. Then, he started to walk and slimmed down even more. He was never an incredibly rolly polly baby, just really solid. Their body shape changes as they grow and even those who have maxed out the rise of the diaper will likely still be using them well into toddlerhood! 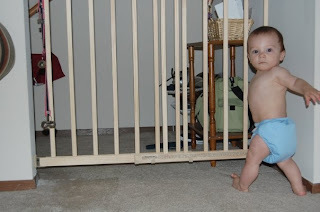 I've also found that the more mobile baby becomes, the easier it is for them to have a lower rise diaper. As the close in on potty training, it more resembles underwear then, too! So, the good news is that when he potty trained just before his 3rd birthday at about 32 pounds, he was still fitting beautifully in his one-size diapers and we had actually snapped man of them down a snap to get a more trim fit under his toddler sized jeans. Just a couple months ago, our family was hit with a stomach virus and at 4 years old and 40 pounds, I put Ian back into one-size diapers for a couple days without any fit issues! 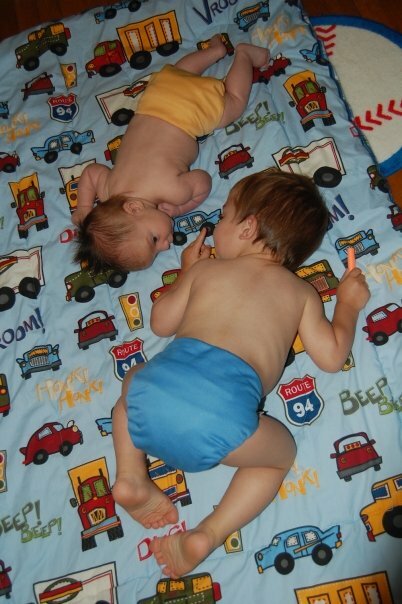 Pictured above, (left) Ian at 7 months old with the diaper fully unsnapped and (right, below) Ian at 2 1/2 years old, still wearing one-size diapers! So if you're like me and many of the concerned parents who's little one seems to be growing at a rapid rate, take a deep breath! You're not the only one to be having the "First Year Freak-Out!"! Congratulations! 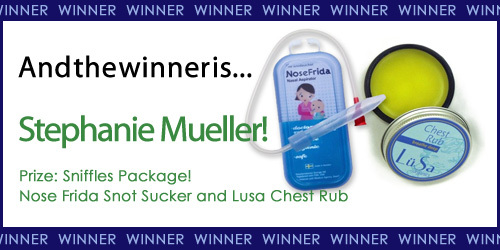 Email annie@nickisdiapers.com within one week to claim your prize! 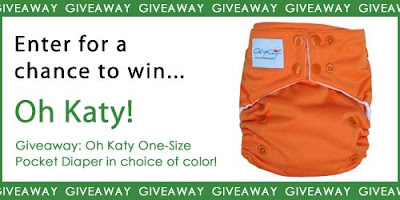 Oh Katy One Size Pocket Diaper Review and Giveaway! There are so many one-size pocket diapers on the market, and I feel like I've tried them all! When we got the Oh Katy One-Size Pocket Diapers in at Nicki's Diapers, it was one that I hadn't tried yet. I wanted to know, "What makes this diaper special?" As soon as I got my hands on it, I saw a few things that made this diaper unique! The first thing that grabbed me were the colors. They are bright and different from every other diaper color out there. I also love that they match their snaps to the color of the PUL. That is attention to detail that I appreciate! Some other features that caught my attention was the pocket opening in the front of the diaper. Removing the insert from a dirty diaper can be a little scary, but having it in the front means you are much less likely to get messy hands! There are also a lot of snaps on the Oh Katy Diaper, and after playing with it for a few minutes, I found that those snaps are part of their ingenious design! 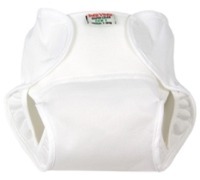 To prevent wing droop on a little one, they have hip snaps, and there are also cross over snaps on the tabs for newborns! When I tried this diaper on Emmett for the first time, he was just over 10 pounds. The fleece on the inside is SUPER soft and the gentle elastic in the legs contains leaks but doesn't leave red marks. It came with 2 inserts, a one-size insert and a newborn insert. Since he was still so tiny, I used the newborn insert on him and it made for a really nice trim fit! Of course, the most important part of a cloth diaper is it's performance, and with this one I didn't have any leaks! The Oh Katy washed up beautifully in my wash! Would you like to try an Oh Katy One-Size Pocket Diaper? Now through February 27th, get 10% off all Oh Katy One-Size Pocket Diapers with free shipping on ALL pocket diapers at Nicki's Diapers! You can also enter below for your chance to win an Oh Katy Pocket Diaper in your choice of color! 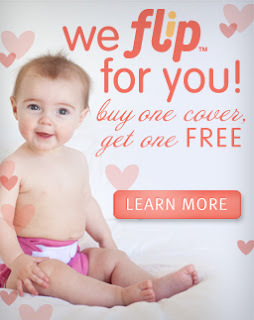 20% off with FREE shipping on ALL diaper covers! Great sales are happening at Nicki's Diapers right now! 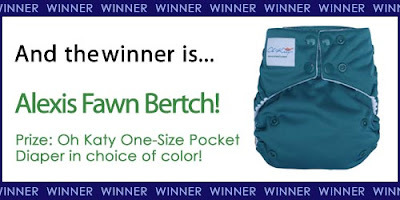 15% off with FREE shipping on all pocket diapers! For more great deals on products you love, visit the SALE section at Nicki's Diapers! $21.95 NOW $15.95 with FREE shipping! I'm so fortunate to have the opportunity to bring my babies to work with me! That being said, it's ESSENTIAL that I have a good baby carrier to allow me to keep my baby close while getting my work done! When I was pregnant with Emmett, I had heard so many wonderful things about the Boba Wrap (formerly called the Sleep Wrap) that I purchased one to try with Sean, my 2 year old. Pictured is a 45 pound child, no sagging! At 28 pounds, I was skeptical about putting him into it and not being comfortable. One of the things that makes the Boba Wrap unique is that it's made with 5% spandex, giving it a nice stretch. 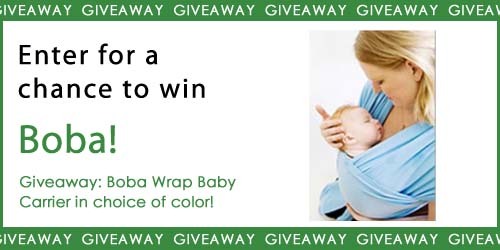 When tying the Boba Wrap, you want to tie it snug against your body. I generally say "sports bra tight". I find this to be a much easier science than trying to figure out how much fabric to allow for your baby! Generally, Sean prefers to be down running around or worn in a back carry so I wasn't sure how he'd like it. I was so surprised how weightless and comfortable he felt in it! He didn't want to be held in it too long, but I think physically I could have worn him for a good long time! Several weeks later, he had a bug and wasn't feeling well. I asked him if he wanted to go in the carrier and he specifically asked for the "hug carrier"! He is right, it is just like giving a long hug to your little one! When I was packing my hospital bag, I saw the Boba Wrap and thought, "why not?". To my surprise, I ended up wearing Emmett during our hospital stay. It was one of the only ways (other than nursing!) that I could get him to completely relax and sleep! 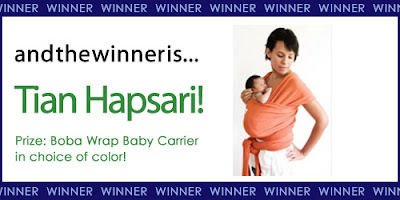 From that point on, I've found the Boba Wrap to be one of the most essential baby items! It's perfect for wearing Emmett around the house, out and about, and at work! I love that I can put the wrap on and just take him in and out as needed without re-wrapping. 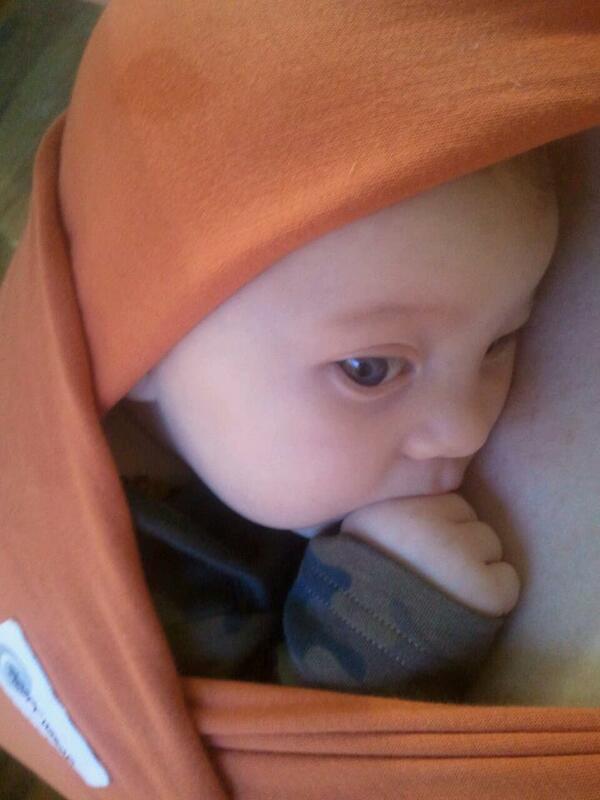 The Boba Wrap allows me to stay sane on days that my biggest boys need lots of attention (which really, is every day!) and Emmett doesn't want to be put down. I just pop him in and he comes along with me wherever I go, and I'm hands-free! When I'm at work, one guaranteed way to get Emmett to sleep is to put him in the Boba Wrap and grab a handful of web orders to pull! Why is the Boba Wrap a great carrier for YOU? Here's why! It's one-size, so it will fit you, your husband, your partner, your grandma... whoever! It's versatile! 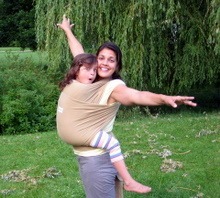 Not only can it be used as a baby carrier, you can also use it as a blanket, nursing cover, burp cloth, or sunshade. It is truly comfortable from birth through toddlerhood. Since you tie the carrier tight to yourself, it forms around the child, preventing them from sagging when they are heavier. 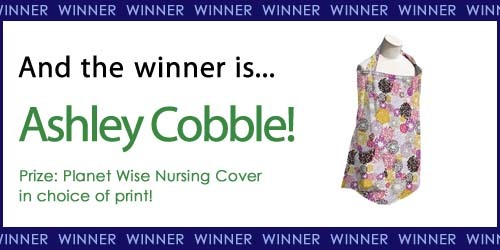 You can nurse on the go and very discreetly in the Boba Wrap! Here is the easiest way to do it! The Boba Family has so generously sponsored the below giveaway of a Boba Wrap in your choice of color (excluding organic) so you can experience just how wonderful it is for yourself! Happy Valentine's Day from Nicki's Diapers! While supplies last, get a FREE Lusa Organics Lip Balm with your order over $25 using code pucker! Hands down the most popular modern cloth diapers on the market right now are one-size diapers. There are many benefits to using one-size diapers! There can also be a few cons to one-size diapers, especially when it comes to using them on a newborn. Most one-size diapers don't start fitting till 8-10 pounds (depending on baby's shape) so you will have to use a "newborn" diaper in the mean time, or some families choose to use disposable diapers till their little one fits into their one-size diapers. Since the diapers have to last through toddler hood, there will be some extra bulk on a smaller baby. The good news is, I believe the pros certainly outweigh the cons! Since cloth diapers have such an awesome resale value (try your local craigslist or a cloth diaper resale website like undermycrib.com), you can start with a newborn stash for the first couple months and easily get a good amount back from re-selling! When you are first trying one-size diapers on your little one, keep a few things in mind. They're going to look HUGE! But remember your baby is going to grow SO fast and they don't move around much as a newborn anyhow. Check the common spots for leaks do to poor fit. Lift their legs up and make sure you don't see any gaps. Make sure wings are tucked in and there is no gapping around the front. Try a few different brands. Something that fits your baby at 3 weeks might fit completely different at 3 months. I generally do not suggest people build their entire stash out of the same brand if they haven't tried other brands yet. Use a sized insert! Many one-size diapers come with 2 inserts, one of them usually termed a "newborn" or "small" insert. Take advantage of these as they will reduce bulk. Another great option is a system like the Best Bottom Diaper with the sized inserts that keep the diaper fitting nice and trim! I've chosen some of the most popular brands of one-size diapers to show you on Emmett. The BumGenius 4.0 One-Size Pocket Diaper is stuffed with 2 newborn inserts. It adjusts with a snap up rise and the stretchy tabs allow for a really custom fit around the waist. These started fitting Emmett (who has very skinny chicken legs) right around 10 pounds. These are also available in a hook & loop closure. The Fuzzi Bunz One-Size Pocket Diaper is stuffed with the "small" insert. It adjusts with elastic in the back and legs to get a great fit! I did find these to have a little more bulk to them when the legs are cinched very tight but they fit closer to 9 pounds. This Best Bottom One-Size Diaper has a small hemp/organic cotton insert snapped in it. These adjust with a snap up rise and close with either snaps or hook & loop around the waist. The extra leg gussets hold even the messiest of messes. These started fitting Emmett at about 9 pounds. 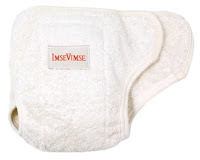 This Imagine One Size Pocket Diaper is stuffed with a small Nicki's Microfiber insert. The inner fleece of this pocket is so incredibly soft and the PUL has a really nice stretch to it. This diaper started fitting Emmett when he was about 10 pounds. My middle son, Sean, at 2 1/2 is pretty much the epitome of a 2 1/2 year old middle child. He's spunky, stubborn and needs lots of attention. After we potty trained my oldest son, Ian, in 3 days, I knew we'd have a much harder time with Sean. Isn't that how it always goes? Sean CAN go on the potty all day, but usually doesn't want to and isn't afraid to tell us that! Now that Emmett is moving into the one-size diapers, we have fewer diapers available for Sean. Knowing that we need something that is easy for him to pull up and down himself and something that will protect from accidents, I was excited to see the Flip Training Pants arrive! The Flip Training Pants Package comes with 5 Organic Cotton inserts that attach into a one-size shell with hook & loop at the front and back. If the insert gets wet, simply change it out for another one! The stretchy side panels have snaps to allow for easy changes, if necessary. They are also interchangeable, allowing your child to customize their trainer! You can also purchase additional 3-packs of inserts if necessary! Sean is not quite 30 pounds now and these fit him on the smallest setting. He's able to pull them up and down with ease and because of the natural fiber insert, he KNOWS when he wet! They are economical in that it's essentially 5 training pants in one. They also protect his clothing from leaks because the shell is waterproof! Once he's daytime potty trained, I envision these being a great option for catching overnight accidents. The top two pictures are Sean (2 1/2 years old, about 30 pounds) and on the bottom is Ian (4 years old, about 40 pounds and heavily bribed for this picture). Babykicks Organics One-Size Fitted Giveaway WINNER! I admit. It's a taboo subject. It's not something you just bring up when you're making idle chat in the grocery checkout line. "Oh, I see you're buying toilet paper. Yeah, I haven't bought TP in a year -- we use family cloth." But my family and I use family cloth and I'm really, really happy with it! So what exactly is family cloth? For us, it's toilet paper and tissues. I know what you're thinking -- ew. It's really not any different than cloth diapers, honestly! I keep separate supplies of each, even from our kids' cloth diaper wipes. Everything is washed separately as well. Cloth diaper wipes have always been washed with cloth diapers, I wash our grown-up cloth wipes by themselves, and I wash our cloth tissues with our towels with a scent-free detergent. I've found a system that works really well for us using Planet Wise flannel wipes (they conveniently come in a pack with lime & chocolate colored wipes, perfect for color coding noses and bottoms...however crude *ahem*) and Planet Wise Wet/Dry bags. I hang a wet/dry bag from our towel rod and put clean wipes in the front pocket. When used, they go in the wet pocket for washing. 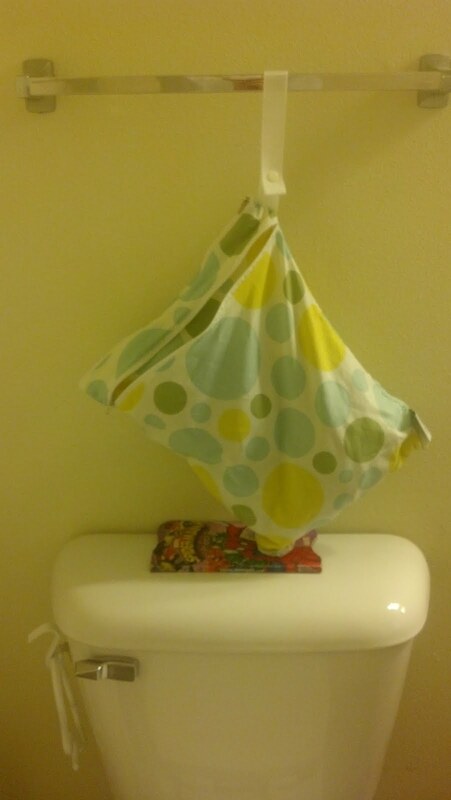 I use a Mini Wet/Dry bag as a tissue box, with clean wipes in the front pocket and dirty ones in the wet pocket. My husband LOVES the cloth tissues, like old fashioned hankies! They hold up so much better to blowing noses and are so soft! The flannel wipes are fantastic for bottoms as well (just like for diaper wipes) as they clean better and you need far less than if you used toilet paper! You can even wet them prior to use to get extra clean. Now, I still keep toilet paper on hand for guests. But I'm teaching our son to use the cloth wipes as he's potty training -- totally easier than having the kid who uses WAY too much toilet paper each time! I never thought I'd be this "crunchy" but it's a huge money saver for us and it's so much easier than I imagined! Now through February 19th, all Zinnia and Noodle Flip One-Size Covers are Buy 1 Get 1 FREE! Hemp plants grow like weeds with few resources, making it very renewable and eco-friendly! Cloth diapers made from hemp are extremely absorbent, but more trim than cotton most synthetic fibers. Hemp is less likely to retain odor and has some anti-microbial properties. When blended with cotton, it's one of the most durable options for cloth diapers. You can read all about my experience with the Babykicks Organics One-Size Fitted Diaper, made with 33% hemp here! 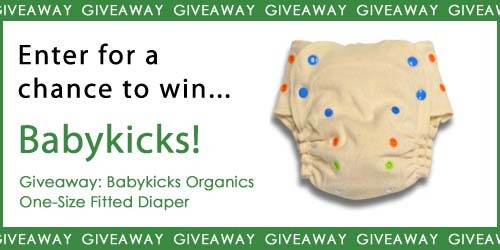 You can enter for your chance to experience the love of hemp with your own Babykicks Organics One-Size Fitted Diaper below! 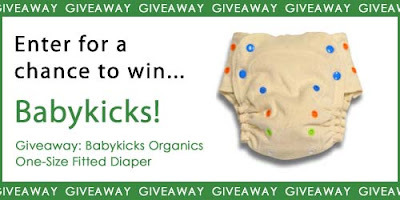 Be sure to join in on the Hemp Day fun on the Babykicks Facebook page and tell them Nicki's Diapers sent you! Something I learned very early on with my first child is that no matter how small the baby, they are fully capable of putting out obscene amounts of urine. I'm all too familiar with double stuffing pocket diapers, adding extra inserts to prefolds and searching for the perfect solution for overnight. It was no surprise to me when our 3rd some came along that he was also a heavy wetter! Even though we were changing him at least twice per night, I still had to construct a properly absorbent diaper to last more than a couple hours without leaking! My search for the perfect night diaper came to an end on night, thanks to a mis-communication between me and a small error by my husband! Instead of putting one of the assigned "night diapers" on Emmett before bed, my husband had a slip of the mind (sleep deprivation?) and put a simple prefold with one of our hand-me-down wool soakers over it. I also forgot to mention to him that I was going to try to avoid changing Emmett's diaper at night because the cool air on his bottom was keeping him awake. Normally, I'd say this was the perfect storm for a full clothing and sheets change in the middle of the night. I was FLOORED when I woke up the next morning and changed his diaper to find that combination. So then I got thinking, if a prefold could hold, can you imagine what a good fitted could do?! Enter, the Babykicks One-Side Hemp Fitted! This diaper is soft, stretchy and can hold a river! It's a pocket fitted that includes a Joey Bunz Hemp insert but can be stuffed with more if you need it! I love the color coded snaps because it makes diaper changes a breeze, knowing which snap I'm snapping without searching. The side snaps make for a nice trim fit, even on my youngest son, and allow for my potty training 2 1/2 year old to pull it up and down on his own. This one-size diapers adjusts with a snap-up rise that fits birth to approximately 40 pounds. Is your baby between snap sizes? Find out how to use a Snappi for a custom fit with the Babykicks One-Size Fitted Diaper here! The gentle elastic in the back and legs hold in messes without leaving red marks and the natural fibers against my boys' SUPER sensitive skin allows for breathability. There is a very informative video explaining all the feature of the Babykicks One-Size Fitted here. Emmett is 2 months old and just over 12 pounds. I use this diaper for him overnight paired with Little Beetle Wool Soaker Shorts. I found the diaper to be absorbent enough with the single hemp insert it comes with, but for larger children I might suggest adding an additional Joey Bunz Hemp Insert. Emmett wears this diaper on the smallest rise setting and on the second smallest waist setting. Lots of room to grow! Why wool you might ask? Wool covers or soakers are really nice for daily wear, but even BETTER for overnight! Wool is a natural fiber, so it's breathable and allows air to your little one's bottom at night, often preventing irritation. It's naturally antimicrobial and won't retain odor. Unless it gets soiled, it only needs to be washed every couple weeks. The best thing about wool for overnight it is absorbs 40% off it's weight in liquid without feeling damp, so it's great for super soakers! Sean is 2 1/2 years old and about 30 pounds. He wears the diapers on the 2nd largest rise setting and since he is potty training, I snap is on the largest waist setting so he can easily pull it up and down. The natural fibers allow Sean to feel if he wets in it, which encourages him to use the potty! I'm so in love with this diaper that I want you to try it, too! Now though February 7th, get 10% off all Babykicks Products! 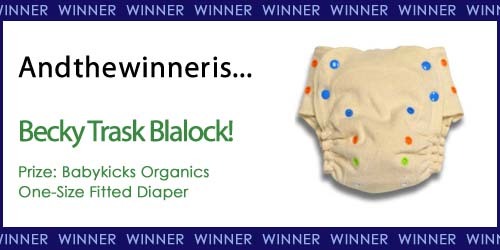 Also, look for a giveaway for your chance to WIN a Babykicks One-Size Fitted Diaper!